iPad owner? PC user? 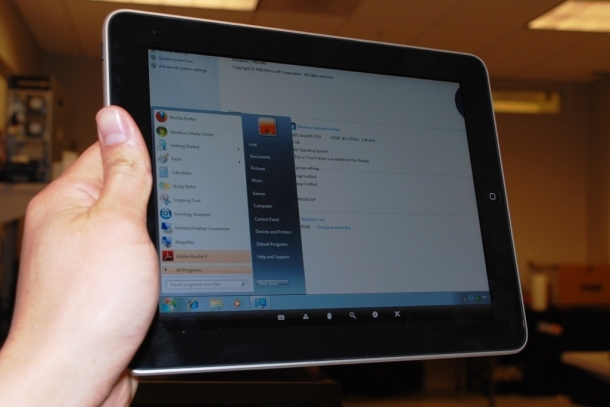 AlwaysOnPC lets you access your PC from your iPad. AlwaysOnPC allows you to access your PC or Mac from your iPad, on the go. Love It: Allows you to view your Office suite, FireFox, Flash and more right from your iPad. Hate It: The app does not yet support Flash audio or full-motion video, and requires an active 3G or WiFi network connection to function. Proving that they are no flash in the pan and having one’s head in the clouds is a grand thing, Xform Computing has released the iPad version of their popular iPhone app, AlwaysOnPC, which allows you to access your home computer from your iPad, anywhere or at anytime, even when your home computer is turned off. The app is feature-rich, giving you use of 40 applications, including the aforementioned Office suite, FireFox, and Flash on your iPad at an extremely low introductory price of $9.99. This iPad app is not compatible with the iPhone version, which is a bit of a let down, but at $9.99, the iPad version of AlwaysOnPc is 40% less than its iPhone counterpart. For anyone that desires to access the files on their PC or Mac from their iPad, there is no better option than the AlwaysOnPC iPad app.